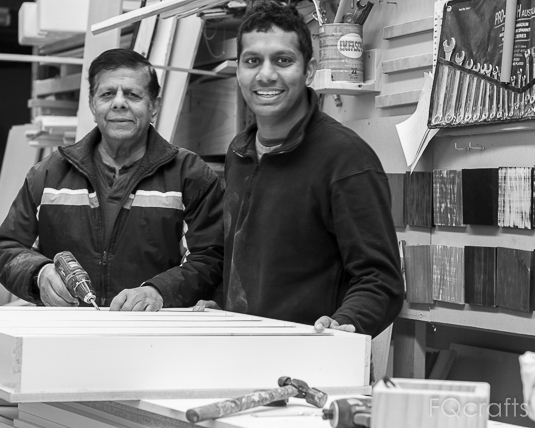 Fabian Woodworks is made up of the dynamic father and son team of Allen and Ian. We work well together and bounce ideas, learn off each others strength, argue occasionally but always inspire each other to strive to be better. Allen is the creative force for all the products you see, he visualises the idea, designs every detail and handcrafts each item. Every item is a labour of love to create something beautiful and long lasting. Ian brings his IT expertise to the business and has worked hard to develop an online presence. He is keen to spread the word about these wonderful items and to reach the people who love them too. Ian also looks after the photography, social media and backend systems to keep this fledgling business growing and has also started to get the 'handy' in handyman by learning off his dad. Every product you see has been cut, shaped, crafted and painted by our own two hands. We envisage products that we would be love to have in our own home and a lot of them have been tested, refined and improved there too. We also understand that each person has different tastes and so with most of our products we offer a variety of different finishes. For a number of our products, we also sell them in different designs and shapes so you can own a truly unique product. We employ sustainable practices in our factory and try to minimise waste by re-using and recycling wherever possible. We generally use Radiata Pine or Hardwood timber that have been sourced from sustainable regrowth plantation forests and ensure our timber suppliers are PEFC Chain Of Custody Certified. Our designs are unique and will bring character and charm to your home. As we design and manufacture these products they can also be customised to your specifications. We love ideas and will happily work with you to realise yours, our customers have been our greatest source of our inspiration. Please don't hesitate to get in touch with us, we would love to hear from you! Please like, follow or share and help us get our message out. We promise to let you know first and keep you regularly updated about the going's on behind the scenes, new products and promotions.